The University Library aims to be a creative learning environment with innovative and relevant services that support to create, disseminate and preserve knowledge. 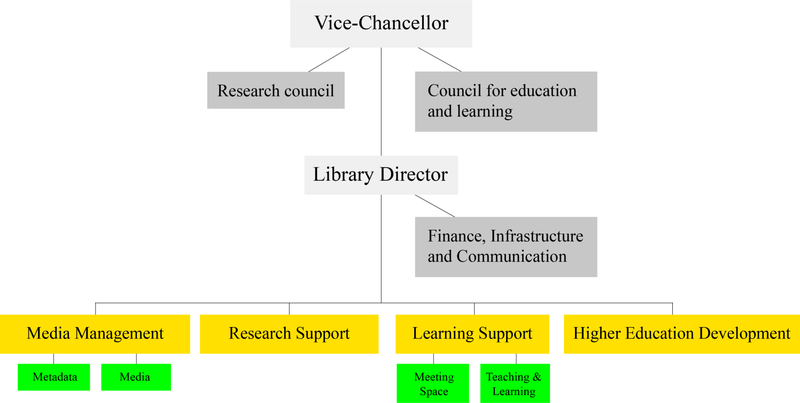 The University Library is organised according to the above chart in order to be able to fulfill its mission, vision and strategy. The majority of the library’s activities are organized into three sections: Learning Support, Media and Publication. The Learning Support section comprises the functions Teaching and Meeting Space, and the Media section comprises the functions Media and Metadata. In addition to the sections, the organisation includes the units Infrastructure and Learning Environment. The management is augmented by staff responsible for finance/HR, project management, quality and communication. The library is organised directly under the rector and is led by a board that is chaired by one of the pro-rectors. Link to Lnu's organisation. The Library Director has the overall management responsibility for the library and its activities and is responsible to the library board and the university management that the library is managed according to its agreed objectives and strategies and in a cost-effective and professional manner. The Library Director has the overall responsibility for the work environment and for the staff of Infrastructure and Learning Environment as well as for overall management support. The head of each section is responsible for the work within their respective sections and for the development of the University Library in its entirety in cooperation with the Library Director. They are also responsible for the staff and work environment within their respective section. The function leaders head the development and everyday work of each function. This work is carried out in close cooperation with the head and staff of each section. Each function consists of staff members that have their main duties in the function's field of responsibility. Function leaders do not have any staff responsibilities. Linnaeus University has an administrative organisation, pm3, which entails that Infrastructure and Learning Environment also are administrative units that are led by administrative managers. They are responsible for the work within their administrative unit but have no responsibility for staff management. The management team consists of the Library Director, section managers, the head of the communications unit and the financial manager. In connection with annual follow-ups, strategical work prior to budget and organisational planning as well as for discussions of strategical importance, the management team is extended to also include function leaders and administrative managers. The present organisation was introduced 1 October 2016 and is based on a substantial organisational change that was established in March 2012. Learning Support coordinates the library’s pedagogical services and support. This section is responsible for support in information searching, information skills, academic writing and study skills. The work is carried out by subject librarians with responsibility for different faculties, the library’s information service and the Academic Support Centre. The Teaching function develops the University Library’s pedagogical activities, aims to provide qualified digital support and teaching that is thoroughly integrated in educational programmes and conducted in close cooperation with programme directors. The Meeting Space function develops the library’s learning environments and service and works for professional meetings in a stimulating and functional environment. The Media section works for an up-to-date collection that is available online and in the physical library and which holds a high standard and the highest possible relevance to research and education at the university; this work is carried out in close dialogue with the faculties and university department representatives. For students this includes course literature and information resources relevant to their education; for researchers it includes access to scholarly material necessary for their research. The section also works to describe the contents of the collection using metadata (data about data) in order to facilitate navigation in the library, in the databases and on the library website. The section includes the Medical e-library for employees in the administrative province of Kalmar. It is a five-year commitment (2015-2020) and the task is to provide library services and supply of relevant media. The publication section offers support in questions about academic publication, bibliometrics and Open Access as well as in issues concerning the accessibility of research data. Linnaeus University Press is part of this section; it works with publishing research publications and with support for scientific publication. The section is responsible for DiVA which is the university’s publication system for research publications and student theses. All students, researchers, and staff members at Linnaeus University must register their publications in DiVA as well as publish them in full text to the extent possible. The section provides the university management with publication statistics from DiVA for the annual report and for the distribution of funding for scientific publication. The section is responsible for the development of the library’s support and education of the university’s post-graduates and researchers. Furthermore, the function is responsible for the preservation and accessibility of the library’s archive collections. Infrastructure is responsible for the library systems, publication systems, search systems for e-resources and other systems within the unit Information and Publication Support. The group is also responsible for coordinating the acquisition of hardware and software for the library. The group is led by an administrative manager with responsibility for both development and the everyday work in the group's area of responsibility. Learning environment is responsible for the learning platform, video systems, evaluation systems and other systems within the unit Learning Environment. The group is led by an administrative manager with responsibility for both development and the everyday work in the group's area of responsibility.